Happy Thanksgiving all. Obviously we were too deep in states of gluttony to post sooner about this awesome show. Kill your post-holiday Monday blues by heading down to Daniel Street tonight. Russian Circles is a three piece instrumental post-metal/post-rock band from Chicago. 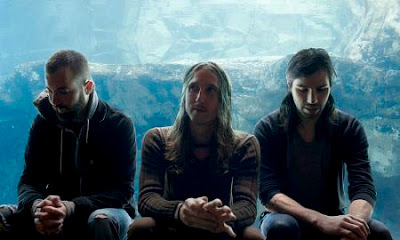 Similar to fellow Chicago residents Pelican, Russian Circles play epic, sprawling music which runs the gamut of heavy discordant metal to soft delicate passages. On Suicide Squeeze. The DC/Chicago/Louisville connection has been a long-standing triangle of similar ideas, ethics and sounds, and Louisville, Kentucky’s Young Widows keep that spirit alive. From the reverb-drenched inspiration of the Regulator Watts/Hoover family to the bass and drums lock-groove perfected by Shellac and the Jesus Lizard, Young Widows gladly wears influences on its sleeve. Ex- Breather Resist, Black Cross and The National Acrobat. On Temporary Residence Ltd. The Phantom Family Halo may be most immediately notable for its pedigree -- members of indie rock royalty The For Carnation, Slint, Dead Child, et al. But, it's the band's sound that becomes the most remarkable upon first listen: Think Syd Barrett jamming with Hawkwind or the 13th Floor Elevators in the height of the Krautrock frenzy, or The Birthday Party subdued to play a rendition of “The Lamb Lies Down On Broadway.” Others have described the Louisville, KY quintet as a unique crossbreed of Alice Cooper, Black Sabbath, Tangerine Dream and Marc Bolan, or Scott Walker fronting Roxy Music.